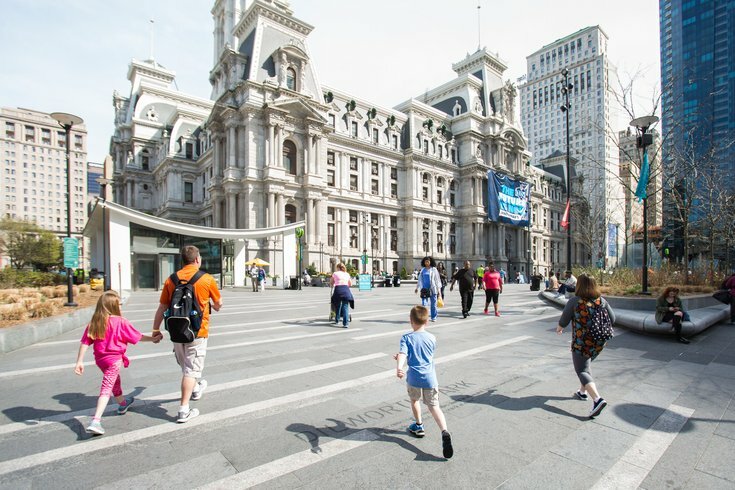 A family enters Dilworth Park. Spring Training will begin at Dilworth Park on Tuesday, April 3. For eight weeks, there will be free, group fitness classes in front of City Hall. There will be workouts Tuesdays, Wednesdays and Thursdays through May 24. You can join in yoga, Zumba, boot camp workouts and group runs – with no registration necessary. Just make sure to check-in once you're at Dilworth Park, and if you plan on participating in yoga, bring a mat. Check out the full list of upcoming workouts here. Each class will be led by local trainers from Optimal Sport Health Clubs. At some classes, experts from Rothman Institute will also offer tips on stretching and injury prevention.